From left, Paul DeMarco, Shay McNamee, Shay’s mother, Marguerite McNamee and Jacqueline DeMarco and Zuzu in front. Shay lost her battle with cancer in 2016. Photo special to the Journal. When Jacqueline DeMarco’s cousin Shay McNamee died from ovarian cancer, DeMarco said, she made sense of it by vowing not to let the loss to her family be in vain. That’s why DeMarco and other people who were close to McNamee run in races such as the Laura Crandall Brown Foundation’s Head Over Teal run. Their group, Shay’s Rays, is one of the biggest teams at every race they go to, she said. They usually have about 50 people in their group. DeMarco’s husband, Paul, is one of Shay’s Rays. He lost his mother to breast cancer, and he talks about the importance of races such as Head Over Teal. Just as Paul DeMarco runs with his wife’s family to honor McNamee, the duo also frequently participate in breast cancer runs. “It’s a great way to keep someone’s memory alive,” DeMarco said. McNamee was diagnosed with cancer in 2012 and died in October 2016. DeMarco still remembers what it was like the day they found out McNamee had cancer. She was having surgery to remove what the doctors thought were benign tumors. During the surgery, the doctor discovered the cancer and was able to remove it, DeMarco said. DeMarco arrived at the hospital before her cousin came out of anesthesia. But doctors had said they wanted to tell McNamee about the developments. The doctors finally gave McNamee the news, and she was in shock, DeMarco said. Although doctors originally gave her a good prognosis, they later realized she had clear cell cancer, which they told her typically came back. In McNamee’s case, it did, six months later, and it had spread to other organs. 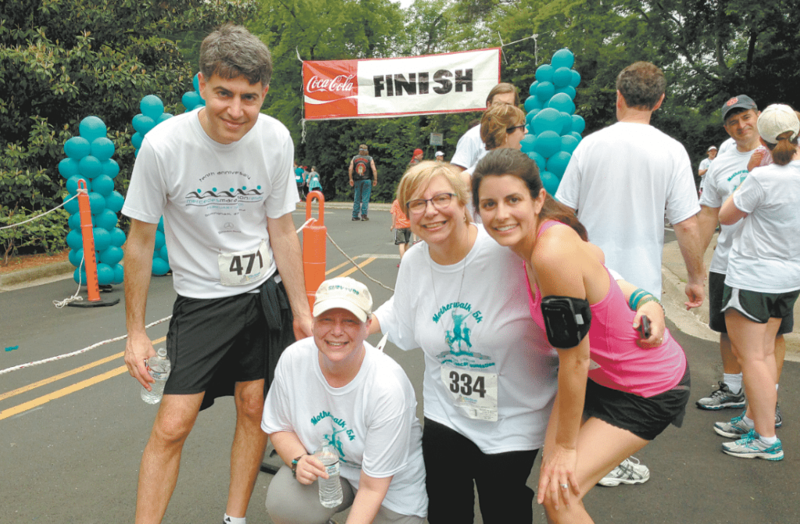 Sometimes McNamee was too sick to walk or run in the ovarian cancer races. “But it always meant something to her that we had the team,” DeMarco said. McNamee died four years and one day after her diagnosis. DeMarco said it really meant something to McNamee to make it to that four-year anniversary. At McNamee’s funeral, DeMarco said that one of the main things people said they remembered about her was her smile. The ninth annual Head Over Teal race is scheduled for Sept. 22 at the Hoover Preserve Town Hall. DeMarco said she hopes the race will spread the word to women to advocate for themselves and go to their yearly GYN appointments. “If one person participates in this race, if one person reads a brochure that gets them to their doctor sooner so that they know they need to get checked, it’s all worth it,” Paul DeMarco said. Laura Crandall Brown Foundation Director Mary Anne King said that more than 800 runners participate in the race. The proceeds from the run help support the LCBF programs, which reach almost 10,000 Alabamians a year. “(It’s) an opportunity (to) pay tribute to all of the women we know and love who have been impacted by GYN cancers – from current patients and survivors to those we have lost,” she said.